Use this section to leave comments that are not relevant to any of the other sections (i.e. General Banter). Simply click on the "comments" link below to add some banter or look at what others have been talking about. You don't necessary need to be a Blogger user but please leave your name so that we know who you are! No I'm not, look at my web site for proof! Is General Banter in the same battalion as Major Headache, and Corporal Punishment? 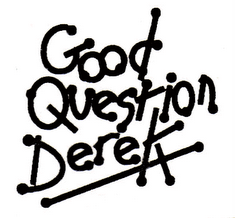 No it's true, I am an idiot, I joined a band called Good Question Derek. What's this "new musical project" called?? Genesis?